Make your fishing trip a memorable one with Anthracite Outfitters. With over 30 years - on the water experience - Anthracite Outfitter Owner/Guide Capt. 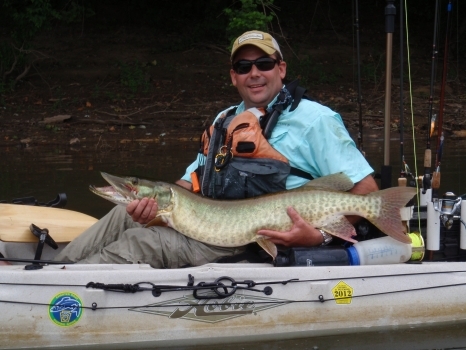 Daniel B Hubbard brings a background in different fishing and outdoor disciplines together to provide a once in a lifetime experience on the beautiful Susquehanna River. Licensed PA Guide & Charter Boat Capt. Dan started fishing in grade school with a surf rod on the Jersey Shore and has been fishing for the last 30 years. He has fished from the distant lakes of Northern Quebec, to the US Virgin Islands, Bahamas, Israel and many places in between for a variety of species including Striped Bass, Tuna, Wahoo, Mahi-Mahi, Bonefish, Redfish, Sea Trout, Large and Smallmouth bass, Walleye, Musky and Northern Pike. Dan is also an accomplished outdoorsmen and paddler who spent his youth in the waves of the Jersey Shore and in the mountains and rivers of Pennsylvania where he gained a respect for the environment and the challenges and joys that it can provide. He started this business after years of kayak fishing and the desire to share his love for the sport and his experience with others. Dan feels the Susquehanna River is one of the most consistent fisheries in the northeast, and that kayak fishing this river is the greatest way to experience and preserve this beautiful resource. PA Licensed and Fully Insured.